The monkey had been purchased as a baby for $6,000 from an exotic pet dealer in Las Vegas, Nevada. After relocating to California and learning that keeping a monkey as a pet is illegal in the state, the woman decided to drop him off at PAWS. A quick search of the area surrounding our sanctuary uncovered a small animal crate with a filthy, cold and frightened little macaque monkey inside. Pat named him Ferguson, after the neighbors (and friends) whose driveway he had been left in. In December 1998, PAWS' cofounder, the late Pat Derby, received a phone call from a woman who wished to remain anonymous, but wanted to let somebody know that she had just left a young monkey in a driveway near our Galt Sanctuary. The monkey had been purchased as a baby for $6,000 from an exotic pet dealer in Las Vegas, Nevada. After relocating to California and learning that keeping a monkey as a pet is illegal in the state, the woman decided to drop him off at PAWS. A quick search of the area surrounding our sanctuary uncovered a small animal crate with a filthy, cold and frightened little macaque monkey inside. Pat named him Ferguson, after the neighbors (and friends) whose driveway he had been left in. 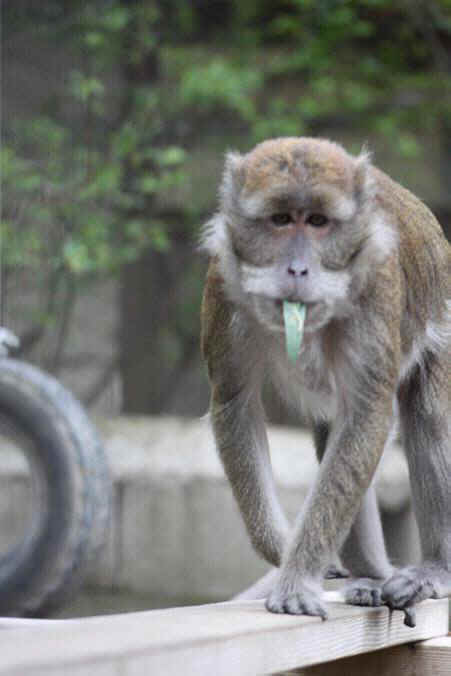 Ferguson adapted to his new life at PAWS very well with the help of a mature resident baboon named Harriet. Starting out as neighbors in adjoining enclosures, they later became roommates. The two were inseparable, with Harriet loving and caring for Ferguson like he was her own baby. Ferguson had a slightly different view of their relationship, and seemed to view Harriet as more of a girlfriend. Their quirky-yet-endearing friendship seemed to work out well for both. When Harriet passed away many years later from heart failure, Ferguson's attention shifted more to his human caregivers. One of Ferguson's favorite treats was roses. He would meticulously take apart the flowers and eat the petals one by one. Pat Derby planted beautiful rose bushes throughout our Galt sanctuary for the monkeys, and keeper Renae remembers picking a rose each evening and sitting with Ferguson while he tore it apart and chattered away contentedly. Other favorite foods were grapes, mandarin oranges, and a variety of seasonal fruits and vegetables selected by keepers from the local farmer's market. Coconuts were a special treat, and Ferguson was an expert coconut cracker! Ferguson was very expressive, talkative and good-natured with PAWS' staff. Keeper Nicole recalls many happy memories and wished to share a few of his antics. "When he was in a particularly spunky mood, and if we were lucky," she remembers, "he would run outside and bounce on his platform. It was like he had springs in his hands and feet! He would bounce up in the air with his head thrown back, then sit down, grab his belly and grunt and smack his lips at us." These playful behaviors all indicated that he was content and feeling good, and we all treasured those moments. Many of our supporters may remember years ago when Pat Derby issued the call for "pillowcases for Ferguson" after he began to gleefully destroy his bed on what seemed to be a daily basis. Boxes of pillow cases began to arrive weekly from Ferguson's adoring fans. Keepers would stuff them with hay to be used as both bedding and toys. Ferguson enjoyed this extra special treatment and keeper Nicole recalls walking by his den and seeing him sitting there with a pillowcase over his head, as if hiding. She would ask, "Where's that monkey?" and Ferguson would immediately pull the case off his head and make affectionate lip-smacks and gestures. Periodically, Ferguson would have mysterious, short bouts of illness where his energy level and appetite were low. 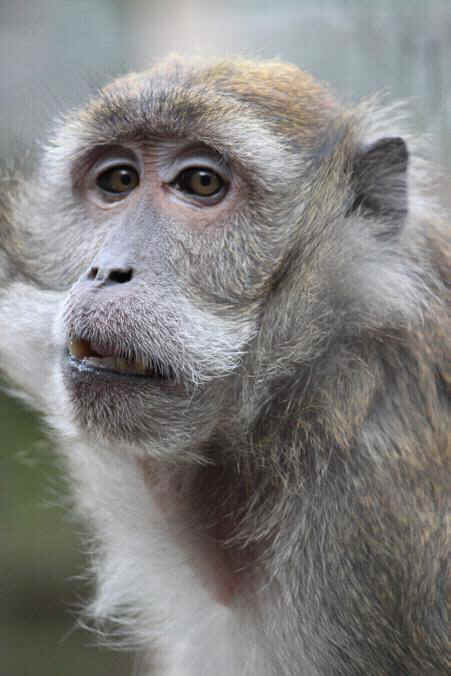 PAWS' veterinarian Dr. Gai worked very hard to figure out the cause, and several years ago diagnosed Cushing's syndrome - a serious illness rarely reported in monkeys. Unfortunately, Cushing's is usually incurable and gradually gets worse over time, although life can be greatly improved and extended by proper medication. Ferguson's medications for liver and stomach issues were specially formulated for him by a compounding pharmacy in a strawberry-marshmallow-flavored liquid that he took daily. Ferguson passed away on January 13th from complications of advanced Cushing's syndrome. He was surrounded by the love of many, including longtime caregivers Larry and Nicole, as well as PAWS' cofounder Ed Stewart and veterinarian Dr. Gai. Heartfelt condolences and thanks go to the dedicated keepers who cared for him throughout his life in our Galt sanctuary, to all of his adoptive parents, and to everyone who loved, admired, and donated to PAWS in his honor over the years. He will be truly missed and has left an indelible mark on all of our hearts.